DISCOVER the brand new BBQ Croc® 18 inch. 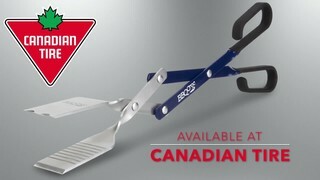 Perfect for all your grilling needs, the BBQ Croc® is a 3 in 1 barbecue tool that GRABS, FLIPS and CLEANS. DISCOVER the brand new BBQ Croc® 18 inch. Perfect for all your grilling needs, the BBQ Croc® is a 3 in 1 barbecue tool that GRABS, FLIPS and CLEANS. Its clever design allows this tool to be used as tongs, as a spatula or as a grill cleaner. No need for dangerous dirty grill brushes, just flip the BBQ Croc® over and scrape your grill clean. With its dual spatula locking system the BBQ Croc® guarantees total grilling control. BBQ Croc® is the longest tool of its category - The 18 inches of length keep your hands from being over the heat so you never get burned. Made out of food grade aluminum, it is rustproof and dishwasher safe. It is the lightest tool of its category, weighing in at as little as 7 ounces. The scissor mechanism allows you to open the jaws up to 6 inches and close them at the perfect angle for extreme precision. BBQ Croc®: the only tool you'll ever need.